Andy's Forum > Categories > Andy's General Forum > Does this mysterious piece of aluminium prove UFOs visited Earth 250,000 years ago? A piece aluminium that looks as if it was handmade is being hailed as 250,000-year-old proof that aliens once visited Earth. The discovery of the mysterious chunk of metal in communist Romania in 1973 was not made public at the time, according to CEN. 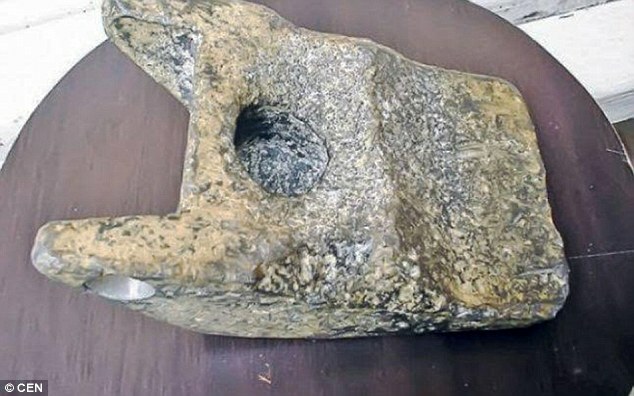 Testing has since revealed that the object is made of 12 metals and is 90 per cent aluminium with Romanian officials dating it as being 250,000 years old. The initial results were later confirmed by a lab in Lausanne, Switzerland, CEN reports. Metallic aluminium was not really produced by mankind until around 200 years ago, so the discovery of the large chunk that it claimed to be up to 250,000 years old is being held up as a sensational find. In 1973, builders working on the shores of the Mures River not far from the central Romanian town of Aiud found three objects 10 metres (33 feet) under the ground. The third looked like a piece of man-made metal, although very light, and it was suspected that it might be the end of an axe. More like proof of another advanced human race, that once lived on this planet, before the great deluge.